I have seen an "EV" (exposure value) scale that's sometimes used to express a camera's exposure settings, or scene brightness. How exactly does this scale work? We know that for any scene (really, any light meter measurement) of a particular brightness (and particular sensor sensitivity) there is usually more than one "correct" set of shutter speed and aperture settings. A scene that wants f5.6 and 1/125 will also be correctly exposed at f4.0 and 1/250 and so on. EV numbers are a way to express the brightness of a scene in a scale that combines the shutter speed and aperture settings into one number -- letting the photographer choose what combination of shutter speed and aperture settings to use. Each EV number equals one stop of brightness, so a scene with an EV of 6 is one stop brighter than a scene with an EV of 5. To show the sensitivity of the light meter itself or of the autofocus system. Camera specs will often say that the metering system works from EV 0 to 20, or that the camera can autofocus down to an EV of 1. Off camera light meters sometimes have a mode that reports in EV, often with a scale so that the photographer can quickly see what shutter speed/aperture combinations are available. Especially with off camera spot meters -- to show the difference in the lightest and darkest part of the scene. The photographer would know if he needed fill light to balance the shadows. This is especially from the film days, where you couldn't judge from an LCD when shooting. For all the technical details (including the formula), look at Wikipedia's "Exposure value" entry. This means that EV 0 equals an aperture of f/1.0 and a shutter speed of 1 second. If you increase the aperture by the square root of 2 or decrease the shutter speed by a factor 2 you increase the exposure value to 1. More generally an increase or decrease of the exposure value by 1 corresponds to what's called a "stop". The exposure value is calculated from the camera's settings and all shots (of a given scene) taken with different settings that correspond to a certain exposure value will yield the same level of exposure. This is useful since you can alter the shutter speed and the aperture, while maintaining the same exposure level to accomplish different effects such as shallow/deep depth of field or freezing of movement/motion blur. If you've metered the light you can calculate the different sets of settings that will give you correct exposure prior to taking the shot. This is what all modern cameras do automatically, but by knowing how this is done you can do a better job yourself and you'll also get a deeper understanding of photography and means to be more successful as a photographer. Exposure Value (or, EV) is a way of representing the brightness of a scene in a simple numeric scale. The scale is measured in "stops", a standard concept in photography where each stop is a doubling or halving of the amount of light. This is convenient, because we also work with the fundamental parameters of exposure — aperture, shutter speed, and ISO sensitivity — in stops. That is, each step on the standard aperture scale (f/1.4, f/2, f/2.8, f/4, f5.6, etc.) represents an opening half the area of the previous step, which of course means half of the light reaches the sensor. And we typically work with corresponding doublings or halvings of shutter time and ISO. That means that if you know the Exposure Value of a scene, either by metering or even by guessing, you can easily set your camera's controls to get the right exposure by using any combination that fits. And, if you know that you want the scene to be brighter or darker than the meter (and therefore automatic program-mode camera settings) say, you can use EV compensation to tell the camera you want something different. This is typical for snowy landscapes — the meter is dumb and doesn't know that that white snow isn't typical medium gray, so you can dial in EV compensation to compensate. I'll get to how one might adjust aperture, shutter, and ISO in a bit, but first, a depiction of the EV scale itself. EV 0 corresponds to a scene which is correctly exposed with a 1 second shutter and a theoretical f/1.0 lens. Brighter scenes go up from that, requiring either a shorter shutter speed or a smaller aperture (that is, higher f numbers). Darker scenes require longer exposures and larger apertures — or, the right combination, since lenses as fast as f/1.0 or even faster are extremely rare beasts. That's a nice enough chart, but I find pictures even more helpful, so here is the above as a series of concentric circles. If I did every whole-number level, each ring would have the same area as all of the rings it contains, but to keep it relatively uncluttered I'm skipping some steps. It is, however, to proper scale — the relative sizes correspond to the increase in scene brightness. So, how can one use this practically? It's pretty simple: once you know the EV of the scene, start at EV 0 (ISO 100, 1 second shutter, f/1.0) and count stops until you get to the desired number. 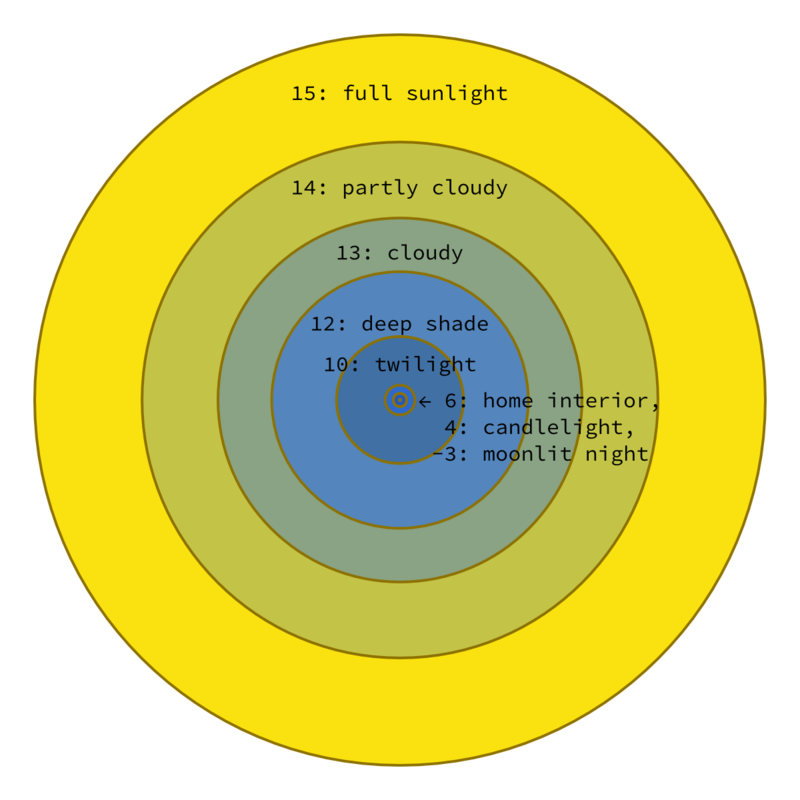 For example, to get to EV 13 — a cloudy day — you might count aperture first: "f/1.4 — one; f/2 — two; f/2.8 — three, f/4 — four, f/5.6 — five, f/8 — six", and then shutter: "½s — seven; ¼s — eight; ⅛ — nine; ¹⁄₁₅th — ten; ¹⁄₃₀th — eleven; ¹⁄₆₀th — twelve; ¹⁄₁₂₅th — thirteen!" Or you can just let the camera's automatic metering handle it for you — but it helps to know what's going on under the hood. Strictly speaking, Exposure Value (EV) is a standardized scale of combinations of apertures and exposure times that are equivalent without regard to any particular level of light or brightness in a scene. Each step on the EV scale doubles or halves the amount of light allowed to fall on a sensor or film if the amount of light striking the front of the lens is constant. Unless otherwise designated, an EV is also understood to be based on a film/sensor sensitivity of ISO 100. 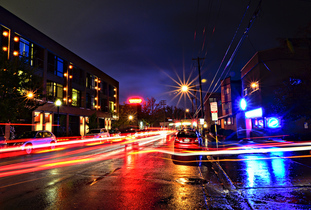 EV 0 is defined as 1 second exposure time at f/1. If we reduce the aperture (Av - for aperture value)) by one stop and double the exposure time (Tv - for time value) we would let half as much light through the lens for twice as long, thus allowing the same amount of total light to strike the film or sensor. Thus 2 seconds at f/1.4 is also equal to EV 0. So is 1/2 second at f/0.7 (there are few if any lenses capable of f/0.7). Remember that the f-number scale is based on a fraction with the focal length of the lens being divided by the diameter of a lens' entrance pupil (the effective aperture - which is measured from the front of the lens). To reduce the areal size of the entrance pupil by half the diameter is changed by 1/√2 or approximately 1/1.4. An aperture of f/1.4 is 1/1.4x as wide (which is the same thing as saying 0.7X as wide) as an f/1 aperture on the same lens and has half the area. An aperture of f/0.7 is 1/0.7x as wide (which is the same thing as saying 1.4X as wide) as the f/1 aperture and has twice the area. The relationship between each value on the EV scale is similar: each increase or decrease of one EV halves or double the amount of total exposure. Again, EV 0 is defined as 1 second at f/1. If we halve the total amount of light we get a value of EV 1 - 1 second at f/1.4 or 1/2 second at f/1, 1/4 second at f/0.7, etc. Halve the exposure from EV1 to get EV 2 - 1 second at f/2, 1/2 second at f/1.4, or 1/4 second at f/1, etc. EV -2 would be 4 seconds at f/1 (or 8 seconds at f/1.4, 16 seconds at f/2, 2 seconds at f/0.7, etc. ), and so on. Sometimes a specific brightness of light is said to equal an Exposure Value. This usage necessarily includes the assumed but seldom articulated condition that a proper exposure of an 18% gray value would result from using a specific EV under the level of light being referenced. Strictly, EV is not a measure of luminance or illuminance; rather, an EV corresponds to a luminance (or illuminance) for which a camera with a given ISO speed would use the indicated EV to obtain the nominally correct exposure. Nonetheless, it is common practice among photographic equipment manufacturers to express luminance in EV for ISO 100 speed, as when specifying metering range (Ray 2000, 318) or autofocus sensitivity. And the practice is long established; Ray (2002), 592) cites Ulffers (1968) as an early example. Properly, the meter calibration constant as well as the ISO speed should be stated, but this seldom is done. Take the "sunny sixteen" rule for instance. The "Sunny Sixteen" rules says that in bright sunlight an aperture of f/16 requires a shutter time that is the reciprocal of the sensor or film's ISO sensitivity. Thus if we're using ISO 100 and shooting in bright daylight we would use a shutter time of 1/100 with an aperture of f/16. That combination of Tv and Av is within 1/3 stop of what is defined as EV 15 (1/125 @ f/16 or equivalent). So while we may say, "Direct sunlight is EV 15" what we are really saying is that using a combination of Tv and Av that equals EV 15 will result in proper exposure of medium gray objects or objects with equivalent reflectance under direct sunlight with a film or sensor with sensitivity to light of ISO 100. We can just as easily use a combination equal to EV 15 to take a severely underexposed photo in a dark room. If we used 1/125 @ f/16 with ISO 100 we've used EV 15 to take the totally black photo. Not the answer you're looking for? Browse other questions tagged exposure terminology metering or ask your own question. What is an easy way to remember the full stop scale? What is Ansel Adams' “Zone System”? What is the fastest lens available for a DSLR? What is EV, when used as an absolute measurement? How do I use the +/- scale of the light meter in my camera? What is the effect of directly changing exposure from the camera's menu? Does a good light meter eliminate the need for exposure compensation? How to get exposure right in night photography?